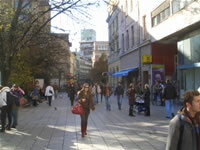 Sarajevo is the capital of Bosnia and Herzegovina. 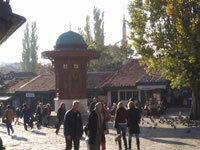 This page will present you with the general information on the country and the city of Sarajevo. The page includes important phone numbers and other information that would help you focus your interest and make your stay in Sarajevo a pleasant one. Bosnia and Herzegovina is a central European country located on the Balkan peninsula. The population 2007 is estimated to about 4,5 million people. Geographically the country borders between Croatia on one and Montenegro and Serbia on the other side. The most of the country is continental with the exception of a thin access strip on the Adriatic Sea in Neum effectively cutting of the Croatian coastline in two parts. Thus, when travelling from northern part of Croatia to Dubrovnik you pass the border at Neum. The country is mostly hilly and mountainous and as such abundant in ore. Formerly Bosnia and Herzegovina was one of the six republics constituting the Socialist Federal Republic of Yugoslavia. During the Yugoslav war the country gained its independance. Today, in Bosnia and Herzegovina live three ethnic groups, Croats, Serbs, and Bosniaks, which is basically determined by religious descent: Croats are Catholic, Serbs are Orthodox, and Bosniaks are of Muslim descent. The country is decentralised and comprised of two political entities: the Federation of Bosnia and Herzegovina (Croats and Bosniaks) and Republika Srpska (Serbs), which was determined by the peace in Dayton. 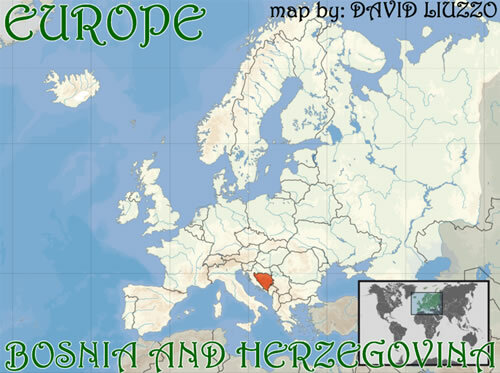 A citizen of Bosnia and Herzegovina is often identified in English simply as a Bosnian. In Bosnia however, the distinction between a Bosnian and a Herzegovinian is maintained as a regional, rather than an ethnic distinction. The telephone calling code of the country is +387. The national currency is the Euro-pegged Convertible Mark (BAM, locally KM), controlled by a currency board. One Euro is approximatelly equal to 1,95 BAM (KM). Sarajevo is the capital and the largest city of Bosnia and Herzegovina with a total population of approximately 600 000 people. 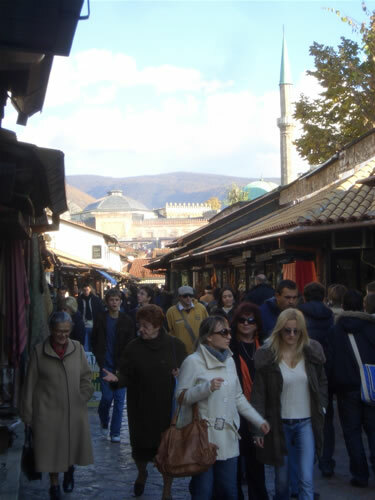 Sarajevo is situated in the area called the Sarajevo Field and the whole area is surrounded by the Olympic mountains. The average altitude of the urban center of Srajevo is 500 m (1640 feet). The mountains surrounding Sarajevo are called the Olympic mountains as Sarajevo hosted the Winter Olympic games in 1984, thus even today some refer to Sarajevo as the Olympic City. Snow sports and winter recreation is a must of Sarajevo. Its Bjelesnica and Jahorina mountains are one of the best European winter leisure spots. Sarajevo is located in the Central European Time zone (GMT +1) which basically means that it is already 1 pm in Sarajevo when it is noon in London. 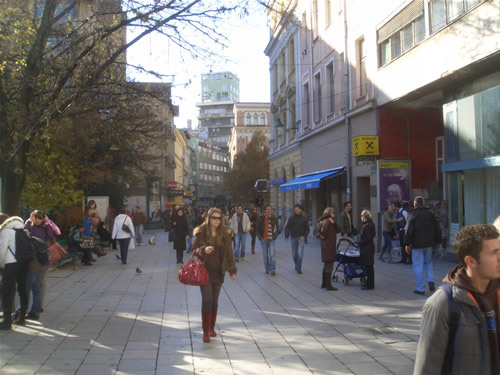 Sarajevo has a mild continental climate with average summer temperature of 19,1°C (66 °F) and avarage winter temperature being -1,3 °C (30 °F). The ones travelling from the US should better prepare with jacks and converters as Sarajevo has a 220 V - 50 Hz frequency electric supply. 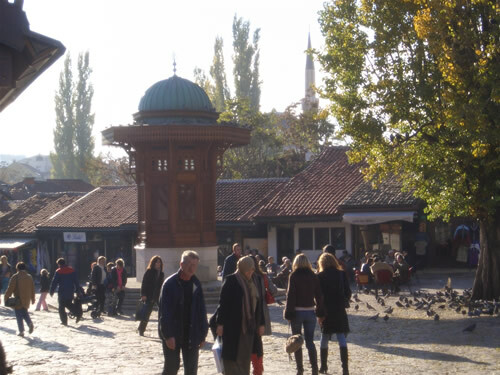 The tap water in Sarajevo is safe to drink as it pours down as cool as the source and tastes really great so don't get surprised when you see people drinking the water from Sebilj (the old traditional fountain on Bašcaršija). You should follow the example. Public transport is the important backbone of the whole Sarajevo as complex network of trams, trolley buses, buses, and mini buses interconnects all parts of the city. Alternative to the public transport is the Sarajevo taxi service as the service provided is one of the cheapest in all of Europe. For an example if you would to take a taxi from Sarajevo airport to the very center of the city it would cost you between 10 and 15 KM (BAM).